We are designing new event t-shirts for this event which will be available for sale at the event for $15 each. Special: Buy 2 7th Annual Spring Meet shirts and get one 6th Annual Spring Meet shirt FREE! This year's awesome shirt design was done by http://www.andywdesign.com - thanks! Last edited by TROLL; 04-11-2013 at 12:13 AM. Can't wait for this!!!! Had a lot of fun last year!!! 2003 RR Mitsu EVO 8 - Current....need a better DD! Will the entering & exiting flow be a little better this year? I was unable to make last years meet, but a couple people that I talked to that were there said it took a long time to get in & parked and an equally long time to get out when they were ready to leave. Silverstone Metallic Base . Brilliant Black R1 . Silverstone Metallic Touring . 20B Chaste White PEP . This sounds like a great event for a great cause. I am down. Hopefully I can convince some friends to come. Made my $25 donation as well. Last edited by Bates; 02-14-2013 at 09:51 AM. I'll probally be sitting this one out. Ill be there! missed it last year because of work. Not this time! Perhaps I'll put this on the TsT Calendar now! i'm interested in going. i had fun last year but i'll be honest.... after a few hours i got bored but i'm willing to give it another shot. I already purchased a VIP spot, and don't plan on staying the entire time. We prefer you not but yes that's fine. There are no trophy's or judging so leaving early will only make a hole were you were parked. Haha I understand. I already purchased a VIP spot as well. I might stay the whole time, I might not, it depends. Can I nominate a car to take my place if I do leave early? lol that would be kind of cool. Damn it. Sunday again. Guess I'll have to get off work. I'll take your spot lol. Really looking forward to this. I moved to New Hope last year so it is right down the road. 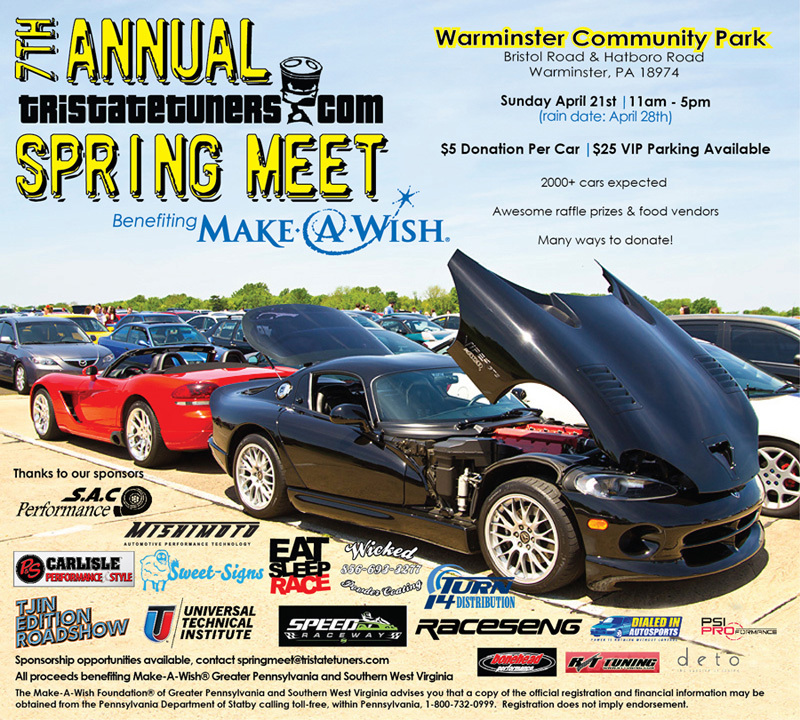 Between this and Philly SCCA I will be at Warminster every other weekend.